Marvel Special Collector’s Edition: Savage Fists of Kung Fu (1975) | 'TAIN'T THE MEAT… IT'S THE HUMANITY! Over the past few months I’ve posted several articles expressing my fondest for Marvel Comics’ Treasury Editions, those oversized reprint collections published in the 1970’s and early 1980’s. Reprint collections were a relatively new concept to the comic book industry in the mid-Seventies, and one that Marvel explored with gusto. They entered into a successful deal with Simon & Schuster’s Fireside Books imprint to publish up-market softcover collections that were aimed at both comic book fans and traditional book lovers alike. Clearly spotting a lucrative new market Marvel also released reprints themselves under their Treasury banner. Marvel released dozens of these collections under various different titles – Marvel Treasury Editions, Marvel Treasury Specials and Marvel Special Editions – all reprinting old, or ‘classic’ stories. Whatever title Marvel chose to use for a particular edition, they all followed the same formula: each measured a generous 10 x 13.5 inches; ran to either 84 or 100 full-colour pages and were perfect bound with cardboard covers. Many of the collections included a brief introduction, a contents page and a gallery of the reprinted stories original comic book covers. Marvel were clearly experimenting with this new format, which I suspect explains the different collection names. They eventually settled on the moniker Marvel Treasury Editions, and published 28 volumes between 1974 and 1981. The other labels – Marvel Treasury Specials and Marvel Special Editions – were only used on a couple of occasions while one, Special Collector’s Edition, was only used once. But that collection would be prove to be unique in another way. Special Collector’s Edition: Savage Fists of Kung Fu was published in 1975, priced at $1.50 (or 50p in the UK) and reprinted stories starring characters created by Marvel to cash-in on the craze of martial arts – or ‘chopsocky’ – movies that swept the US in the early Seventies. In early 1974 Marvel released a new monthly magazine to exploit interest in the genre, publishing it under their mature readers imprint Curtis. The Deadly Hands of Kung Fu premiered in April 1974 and featured 68 black and white pages of comic stories, articles, pin-ups and movie reviews. During it’s 33 issue run (plus one special) the magazine starred two of Marvel’s most popular martial arts heroes, Shang-Chi: Master of Kung Fu and Iron Fist, as well as stories featuring The Sons of The Tiger, The White Tiger and the Daughters of The Dragon. Savage Fists of Kung Fu reprinted two stories from the first two issues of this new monthly title (originally published in April and June 1974), and three stories from The Deadly Hands of Kung Fu, Special Album Edition No. 1 (June 1974). All the stories were recoloured for this collection which also featured a contents page and a cover gallery on the inside front and back covers. Strangely this cover gallery didn’t reprint covers from the Curtis title but instead featured artwork from Marvel UK’s weekly title The Avengers, which also starred Shang-Chi. 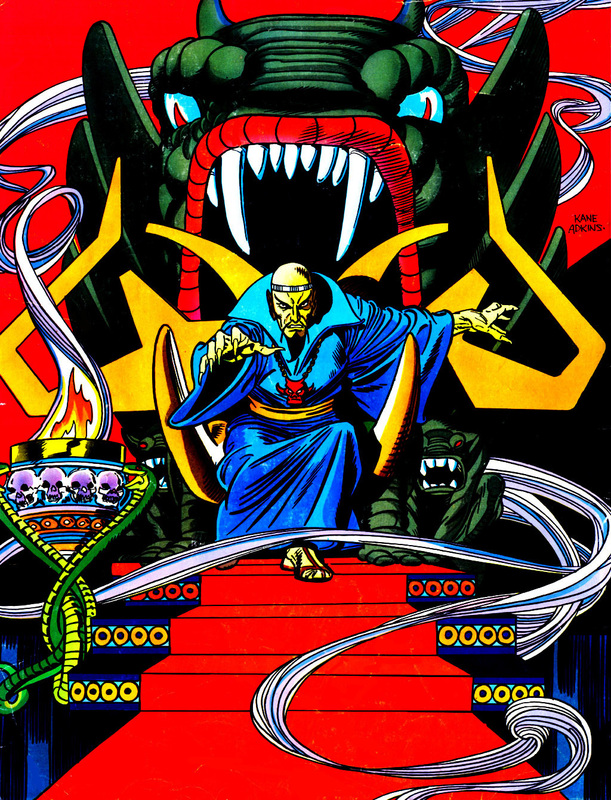 The suitably dramatic front cover was pencilled by Gil Kane and inked by Dan Adkins, with John Romita pencilling and inking Shang-Chi’s face. The back cover, featuring a menacing Fu Manchu, was pencilled by Kane and inked by Adkins. 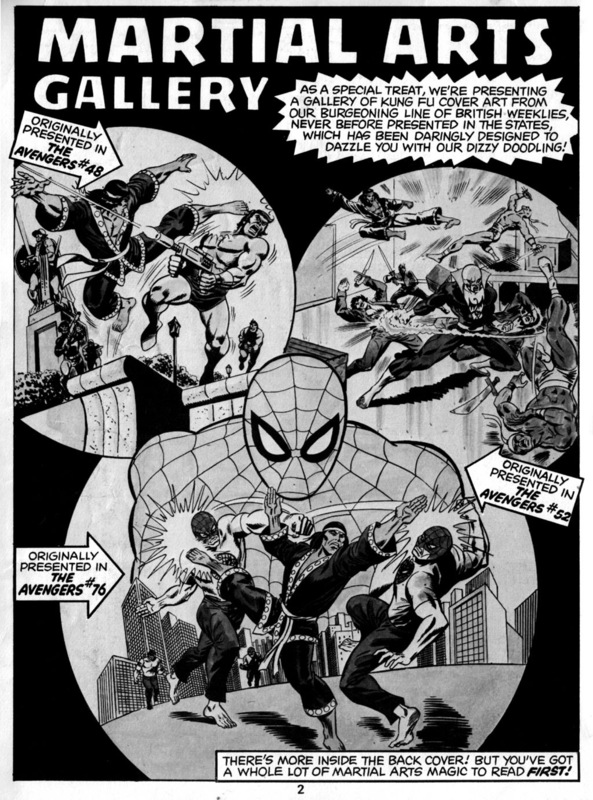 Reprinting stories from the black and white magazine, instead of the colour monthly comic books, did provide one benefit for this edition: the artwork didn’t have to be cropped to fit the Treasury’s squarish proportions, a fate that befell the stories reprinted in The Spectacular Spider-Man Special Edition #1. Saying that two pages from the Sons of The Tiger story were inexplicably printed out of sequence. 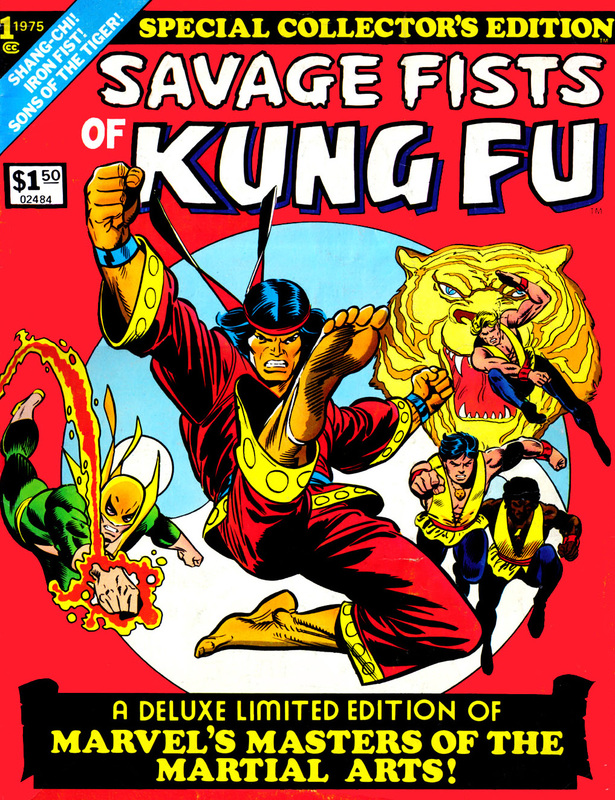 Despite being labelled as issue #1 (a common practice with Marvel Treasury’s) Savage Fists of Kung Fu was the only Treasury published under the Special Collector’s Edition banner. 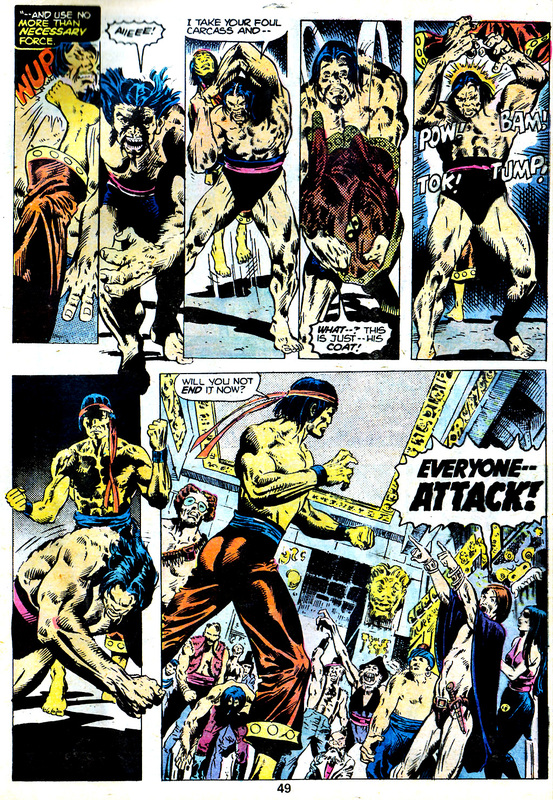 However it does deserve another footnote in comic book history – it’s one of the few times stories featuring Shang-Chi have ever been reprinted. 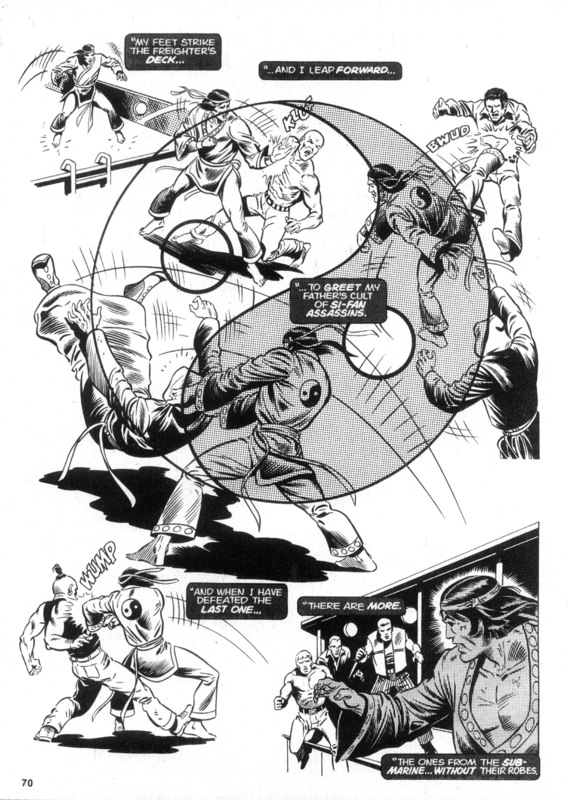 Although the character has been resurrected in recent times, and contemporary stories have appeared in trade paperbacks, reprints from his early appearances in The Deadly Hands of Kung Fu and from his own long running monthly colour title, The Hands of Shang-Chi, Master of Kung Fu, have rarely seen print. 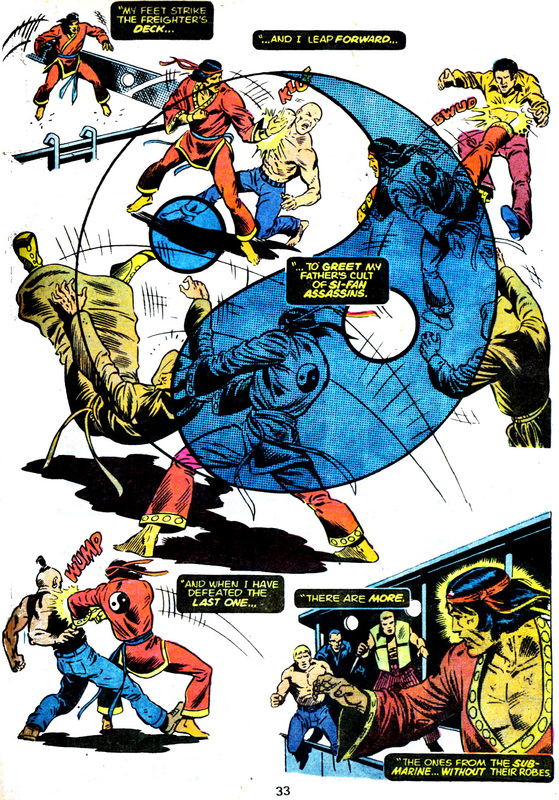 The reason for this was Marvel’s decision to incorporate Fu Manchu as Shang-Chi’s father. The character was originally created by Sax Rohmer in 1913 and used by Marvel under license. When that license expired Marvel lost the rights to reprint stories featuring the character, and by association, Shang-Chi. So, if you’re lucky enough to have a copy of Savage Fists of Kung Fu, you also have a rare piece of comic book history.